Secondly, there has been a major advancement in the Cromwell period (The Protectorate) knowledge. As you see on the website, a ring was discovered by myself on 10/10/10 which holds a date 29 August, 1657 (to be in Epping Forest museum in the spring). Anyhow, so I'm wandering around the fields after the harvest and on this particular field where I found the ring, I find a ew hammered coins, mostly from Elizabethan times. So, I returned to the field exactly 2 years to the day after finding the ring and out pops a gold button which I reckon is of the same period so there was a seriously rich Cavalier family living in Chigwell during the reign of Oliver Cromwell. It's in the Museum of London for analysis and is returned later this month. The finding of this button is on the main page. Anyhow, so interestingly, out from another field comes a 1650s german coin which suggests the time of Prince Rupert. It's a great video to watch finding that! So rich family with mercenaries protecting them? Not necessarily since the hammered coin has a hole in it indicating that it was worn but it could have been a way of making payment since coins of the time were based on their precious metal content. All interesting stuff! In the Museum of London again. Will keep you informed. Good luck! 1998. Clark, F. R. Published by West Essex Archaeological Group. This place is called, in the most ancient records, Cingwella, which some suppose to signify the King's Well; others derive the last syllable from the Saxon word Weald, or wood (fn. 1) . This etymology, perhaps, is the more probable, as it was in ancient times a part of the royal demesnes. 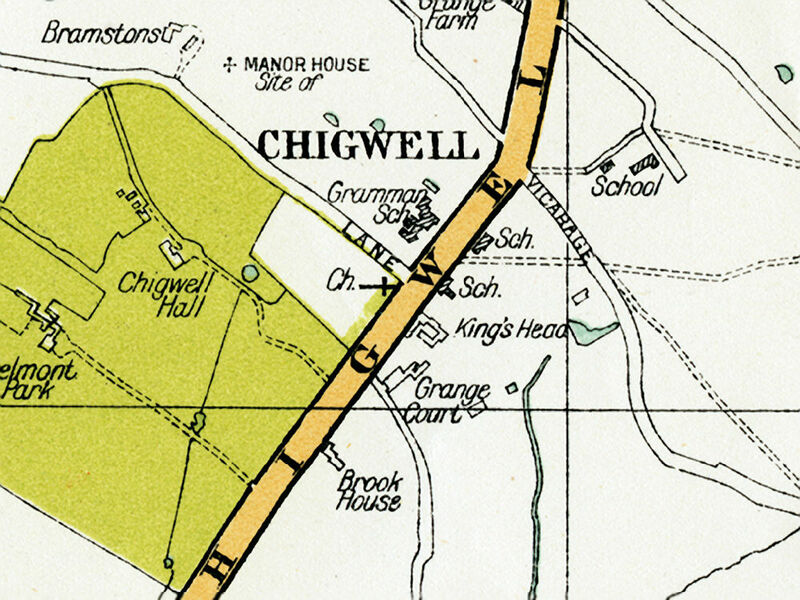 Later records have varied the name to Chykwell and Chigwell. This village lies in the hundred of Ongar, at the distance of about ten miles and a half from London on the Ongar road. The parish is bounded on the east by Lambourn, north-east by Loughton, north by Chingford, west by Woodford, south-west by Barking, and south by Dagenham. It contains, according to a survey made in 1611 (fn. 2) , 2527 acres of cultivated land. The proportion of arable to pasture is about three to one. 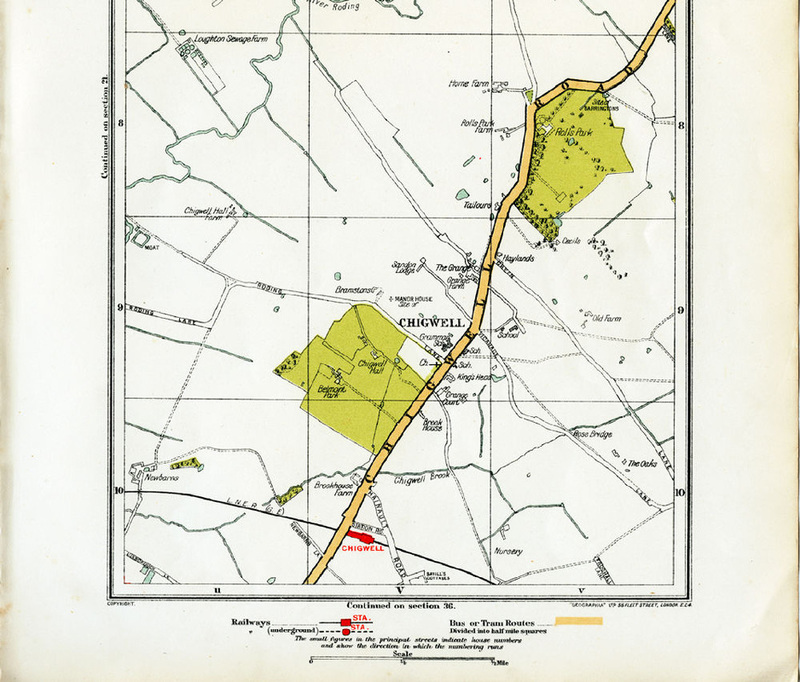 Its share of Epping and Hainault forests (both included in the ancient forest of Waltham) is not ascertained, but is known to be very considerable (fn. 3) . The soil in the neighbourhood of the village is a light gravel mixed with sand, and abounding with springs; in other parts of the parish a stiff clay, without water. This parish pays the sum of 577l. 2s. to the land-tax, which is at the rate of about 2s. in the pound. The manor of Chigwell-hall was held under Edward the Confessor by Earl Harold. In William the Conqueror's reign it was the property of Ralph de Limesei (fn. 4) , whose great grandson Alan granted it to Richard de Luci, and the latter to Ralph Briton (fn. 5) . A subsequent grant was made by Richard de Luci to William Goldyngham, at the petition of Briton; and another at the request of Goldyngham to Robert, son of Ralph Briton, to whom Goldyngham granted this manor in see and for ever. A sum of money was given each time, and homage paid (fn. 6) . All this happened in the reign of Henry II. : the manor, nevertheless, appears to have been continued after this for several generations in the family of Goldyngham, who held it under the Lords Fitzwalter (fn. 7) . In the year 1382, Sir Alexander Goldyngham had the royal licence to impark 50 acres of land in Waltham forest, adjoining to his manor of Chigwell (fn. 8) . It appears to have been afterwards in the Bourchier family (fn. 9) . John Mannock died seised of it in 1476 (fn. 10) . In 1534, his son George sold it to Sir Thomas Audley and others (fn. 11) for the use of the crown, as it is supposed. In 1538, being then vested in the crown, it was leased to William Rolt (fn. 12) . King Edward VI. in 1550, granted it to Sir Thomas Wroth (fn. 13) ; in whose family it continued till the year 1669, when it was sold to Sir William Hickes, Bart. (fn. 14) ; from whom it has descended to the present proprietor Michael Hickes Beach, Esq. M. P. for Cirencester, (second son of Sir Howe Hickes, Bart.) who enjoys it under the wills of Sir Harry Hickes, who died in 1755, and Michael Hickes, Esq. who died in 1764. Sir Harry Hickes sold the manor-house (called Chigwell Hall) and the demesne lands to William Davy, Esq. ; of whose executors they were purchased by James Urmston, Esq. : Mr. Urmston sold this estate to — Mossat, Esq. ; of whom it was purchased by Eliab Harvey, Esq. the present proprietor. The house is in the occupation of Mr. Blackman. The manor of West-hatch was the property of the Goldynghams. In the year 1410, Sir Walter Goldyngham settled it (in default of issue from himself and his wife Elizabeth) on Robert Wrytele or Writtle (fn. 15) . Walter Writtle died seised of it in 1476 (fn. 16) . In 1534, it was vested in George Mannock, Esq. who then sold it with the manor of Chigwell Hall to Sir Thomas Audley, and others (fn. 17) . It has since passed through the same hands. The manor-house, which stands about a mile from the church, on the road to Woodford, was the residence of Sir William Nutt, who died in 1673 (fn. 18) . James Crokatt, Esq. of Luxborough-house, having purchased it (about the middle of this century), it was sold by his heirs to Sir Edward Walpole, K. B. It afterwards became the property of Mr. Nutt, whose widow conveyed it to George Curling, Esq. ; Mr. Curling sold it to Lady Hughes, (relict of Sir Edward Hughes, K. B.) the present proprietor. A new house having been lately built near the same site, the old house is about to be taken down. The manor of Barringtons, alias Rolls, is supposed to have been that estate, which, in the reign of King Edward the Confessor, was held by one Doth; and at the time of the Norman survey, by Anschetill, under Robert Gernon (fn. 19) . The manor of Barringtons was granted about the reign of Henry II. by Alberic de Vere to Sir Humphrey, son of Eustace de Barentone. It continued in this family (being still held under the Veres, Earls of Oxford, and called the manor of Chigwell, alias Little Chigwell,) as late as the year 1537, when John Barrington, Esq. died seised of it. Stephen Wiseman died seised of it in 1563 (fn. 20) ; Thomas Wiseman, Esq. in 1584. It was sold by another Thomas Wiseman to John Hawkins; and about the middle of the last century a moiety of it was purchased Eliab Harvey, Esq. (brother of the celebrated Dr. Harvey), whose descendant of the same name (Captain of the Valiant man of war) is the present proprietor. The other moiety was in the Comyns family about the year 1695, and afterwards came, by intermarriage, to Sir Hugh Myddelton, Bart. of whom it was purchased by the Harveys (fn. 21) . The manor-house is about a mile north of the church, and is the residence of Capt. Harvey. It was not originally the site of the manor, but a mansion unconnected with it, called Rolls, which was purchased by Sir Eliab Harvey, (son of Mr. Harvey who bought the manor,) and made the manerial residence (fn. 22) . Manor of Woolston, or Wolverstone. The manor of Woolston or Wolverstone, anciently called Ulfeestun, was the property of Earl Harold. When the Norman survey was taken, it was a part of the royal demesnes (fn. 23) . Henry the Second granted it to the family of Sandford (fn. 24) , who held it in grand serjeanty as chamberlains to the Queen (fn. 25) . Hugh Earl of Oxford purchased the wardship and marriage of Alice, daughter and heir of Gilbert de Saundford, for a thousand marks, as some records state it, King Henry III. ; or, as others seem to represent it, of Fulk Basset, Bishop of London, who had bought it of the King for the same sum (fn. 26) , perhaps as a trustee for the Earl; who bestowed her in marriage on his eldest son Robert, who succeeded him in the title, and in right of his wife became Baron Sandford. By this lady (besides Robert his son and heir) he had a daughter Joan, who married William, the eldest son of John Earl Warren and of Surrey, and had the reversion of this manor (fn. 26) as a part of her marriage portion. On the death of John Earl of Surrey (son of the said William and Joan) without lawful issue, in 1347, this and his other estates devolved upon his sister Alice, wife of Edmund Earl of Arundel (fn. 27) . The possessions of this family were twice forfeited by attainder, and restored; after which Thomas Earl of Arundel died seised of this manor in 1414, when the inheritance came between his three surviving sisters (fn. 28) . Sir Rowland Lenthall, who married Margaret Fitzalan, leaving no issue at his death, in 1451 (fn. 29) , his share was divided between the Norfolk and Bergavenny families, who represented the other coheirs. John Duke of Norfolk was slain at Bosworth-field, and his estates became forfeited (fn. 30) . The whole of this manor, being afterwards vested in the crown, was granted, about the beginning of Henry the Seventh's reign, to William Scott, Esq. a lineal descendant of Sir William Scott, Lord Chief Justice of the King's Bench, who died in 1346 (fn. 31) . It continued in that family till the death of George Scott, LL. D. in 1780, when it was inherited by Robert, son of William Bodle, Esq. (by Elizabeth, daughter of George Scott, Esq. who died in 1710 (fn. 32) ). It is now the property of Robert Bodle, Esq. son of Robert above mentioned. The manor-house stands about a mile and a half eastward from the church: it is at present unoccupied. The manor of Grange-hill, or Chigwell Grange, belonged to the priory of Tiltey; on the suppression of which it was granted, anno 1537, to Thomas Addington (fn. 33) , who, in 1554, sold it to James Altham, Esq. (fn. 34) : of him it was purchased by Sir Anthony Browne, who made it a part of the endowment of his free school at Brentwood (fn. 35) . The first mention I have found of the manor of Luxborough is in 1605, when Sir Robert Wroth died seised of it (fn. 36) ; since that time it has passed with the manor of Chigwell-hall. The demesne lands of the manor of Luxborough were purchased in the early part of this century by Robert Knight, Esq. cashier of the South Sea Company, who built on them a noble mansion called Luxborough-house, which, upon the estates being seized and sold by the South Sea Company, was purchased by Sir Joseph Eyles (fn. 37) . Upon his death, in 1740, it was repurchased by Mr. Knight. His son, who succeeded to this estate, was, in 1746, created an Irish peer, by the title of Baron Luxborough, and in 1763, Earl of Catherlough. In 1749, he sold the estate at Luxborough-house to James Crokatt, Esq. (fn. 38) , whose heirs aliened it to Sir Edward Walpole, K. B.; Sir Edward sold it to Samuel Peach, Esq. who soon afterwards conveyed it to Sir Edward Hughes, K. B. That eminent naval officer made it his countryhouse, and died there, Jan. 17, 1794. It is now the property and residence of his widow. Ancient palace, called Potteles, or Langford's, now King's-place farm. Within this parish, in the forest, was an ancient palace, called Potteles, alias Langford's. A purchase was made by the crown in this parish as early as the year 1350 (fn. 39) , and another purchase of a house and lands, by Edward IV. of Robert Langford, in 1477 (fn. 41) . It is probable that the King granted this house and lands to his brother the Duke of Clarence; for it appears upon record, that Potteles-place, alias Langford's, came to the crown on the death of that prince (fn. 42) . Henry VII. appointed Sir John Risley keeper of his palace at Chigwell (fn. 43) ; and, on his death, Sir William Compton had a grant of that place, anno 1513 (fn. 44) . William Lord Compton obtained a renewed grant from Queen Elizabeth in 1596 (fn. 45) . Sir Thomas Perient was possessed of the fee of this estate in 1650 (fn. 46) . It was then called the manor or reputed manor of King's-place, alias Langford's, &c. Henry Goodricke, Esq. having married Mary Ernle, a relation of Lady Perient (fn. 47) , this estate was settled on her; and, in 1658, was conveyed by the said Henry Goodricke and his wife Mary to William Livesaye, Gent. In 1679, William Livesaye the elder, and William Livesaye the younger, aliened it to Mrs. Elizabeth Collwall, widow. Thomas Gibson and John Jacob, trustees under the will of Daniel Colwall, Esq. who died in 1707 (fn. 48) , conveyed it, in 1716, to Percival Chandler, whose son Thomas, in 1741, sold it to Oliver Marton, Esq. In 1759, it was purchased of the Rev. Oliver Marton, (brother and heir of Edward Marton, Esq. who was son and heir of Oliver,) by Robert Jones, Esq. It is now the property of his grandson R. Jones Adeane, Esq. Buckhurst, alias Monk-hill, now Monkhams. An estate in this parish and Woodford, called Buckhurst, alias Monkenhill, (now Monkhams,) belonged to the abbot and convent of Stratford Langthorn (fn. 48) , and was granted, anno 1547, to John Lyon and his heirs (fn. 49) . Henry Lyon died seised of it anno 1590 (fn. 50) . It is now the property of Lady Hughes (fn. 51) . There was an estate also (in the parishes of Chigwell and Barking) called Buckhurst, alias Goldhurst, which Sir Walter Goldyngham settled on Robert Writtle. Walter Writtle died seised of it in 1476 (fn. 52) . It is most probable that it descended, with the manors of Chigwell-hall and West-hatch, which were also in the Goldynghams and the Writtles. The parish-church, dedicated to St. Mary, consists of a chancel, nave, and north aisle. At the west end is a wooden belfry, with a spire. The south door is of Saxon architecture, with lozenge mouldings. Against the south wall of the chancel is a monument of alabaster and veined marble, (with the effigies of the deceased in kneeling attitudes,) to the memory of Thomas Coleshill, Esq. (fn. 53) , servant to King Edward IV., Queen Mary, and Queen Elizabeth, and inspector of the customs for the city of London, ob. 1595. Mary, his wife, daughter of George Crayford, Esq. died in 1599: they were married fifty years. The monument was put up by Sufanna, wife of Sir Edward Stanhope, and Anne, wife of Jasper Leeke, Esq. daughters and coheirs of the deceased. On the north side of the chancel, against the wall, is fixed the effigies, in brass, of Archbishop Harsnet. It was removed from the floor, and is in perfect preservation. It is surrounded with a border of brass, on which is the following inscription, written by himself, and directed by his will to be put on his tomb (fn. 54) : "Hic jacet Samuel Harsnett, quondam vicarius (fn. 55) hujus ecclesiæ, primùm indignus Episcopus Cicestrensis, dein indignior Episcopus Norwicensis; demùm indignissimus Archiepiscopus Eboracensis qui obiit xxv die Maii, anno Domini 1631." On the chancel floor are the tombs of Elizabeth, wife of Francis Langston, Esq. serjeant at arms, and daughter of Sir Edwin Sandys, Knt. 1639; Anne, wife of John Nutt, Esq. and daughter of Sir Edward Master of East Langdon in Kent, 1641; Susanna, wife of William Nutt, and daughter of John James, Esq. 1643; Sir William Nutt, her husband, 1673; and Capt. Joseph Cave of the Royal Navy, 1781. The east end of the north aisle is called Scott's Chancel, and belongs to Woolston-hall. In this chancel are monuments to the memory of George Scott, Esq. (fn. 56) , 1683; Elizabeth, his wife, daughter of Robert Cheyne, Esq. of Bramhanger, 1705; William Scott, Esq. (fn. 56) , 1725; Catherine, his wife, daughter of Thomas Luther, Esq. 1710; and Thomas Scott, Esq. 1732. In this chancel also is an achievement for William Derham, D. D. president of St. John's College in Oxford, who died in 1757, and one for Bishop Gibson, whose daughter Jane married George Scott, LL. D.
In the north aisle is the monument of John Thomas Kilpatrick, 1791; on the south side, affixed to one of the pews, is a brass plate (with the effigies of the deceased) to the memory of John Hodgson, Gent. of the Middle Temple, (son of John Hodgson, merchant,) who married Mary, daughter of John Penington of Chigwell, ob. 1620. On the floor are the tombs of John Penington, Esq. (fn. 57) , 1702; Sarah his wife, daughter of Sir Robert Abdy, Bart. 1690; Mrs. Ann Pelling, widow, 1712; and Mrs. Sarah Hunt, 1769. Near the door of the north aisle is a brass plate with the following inscription: "Pray for the soule of Thomas Ilderton, stoksemonger of "London, who dyde inlentle (lengthen) this isle from ye northe dore hitherto; and also dide gyfe certen lands towards ye sustentation of a chantre prest to synge at treneteal, and to helpe devyne service in the quere upon holy daies, as by his wyll there made it does apere, on whos soule Jhu have mercy; whiche Thomas decessyd the day of—, an° Domini 1500." On the pillars between the nave and the chancel on the north side are the monuments of Martin Capron (fn. 58) , 1715; and the Rev. George Heriott (fn. 59) , rector of South Fambridge, 1723. In the church-yard are the tombs of Mr. William Browne, 1653; Thomas Browne, 1676; Mary, wife of Thomas Scott, Gent. 1720; Mr. Josiah Seale, 1772; John Sharp, engraver, 1786; Elizabeth, wife of John Moxon, 1788; and the Rev. Peter Thomas Burford, 1794. The advowson of the church of Chigwell (which is in the diocese of London and the deanery of Ongar) was formerly annexed to the manor, and held together with it by the family of Goldyngham. 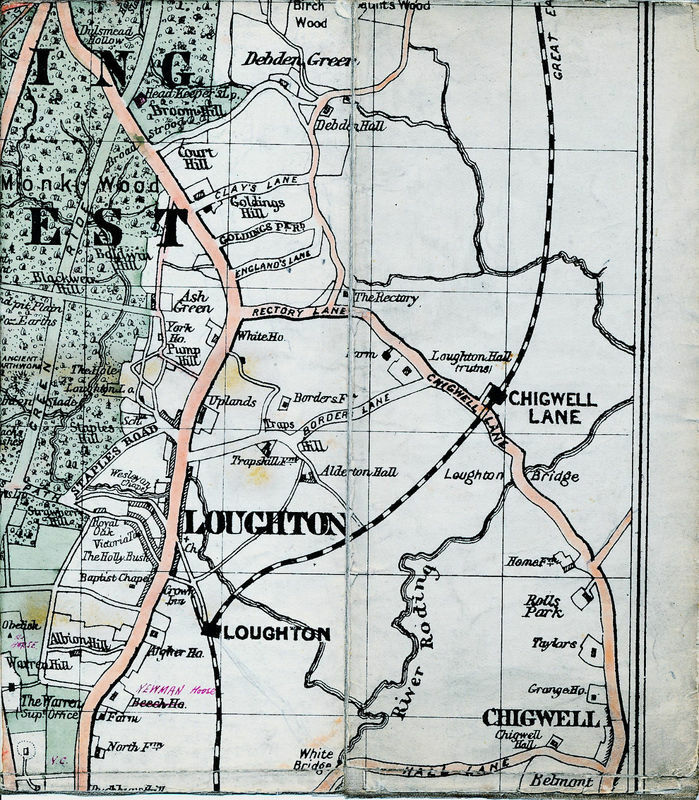 In the year 1350, Thomas Ecclesle, parson of Lambeth, and others, had licence to appropriate the church of Chigwell (held under the Lords Fitzwalter) to the priory of Latton (fn. 60) . How it became vested in the above parties, or how long it continued appropriated to that priory, does not appear; nor does it appear that they ever presented to the vicarage. In 1404, Bartholomew Lord Bourchier granted the church of Chigwell to John Doreward (fn. 61) , who, in 1439, gave it to the priory of St. Botolph in Colchester (fn. 62) , to which convent it was afterwards appropriated; but they had not been long in possession, before (by some exchange, it is probable) it came into the hands of Bishop Kemp, who, having founded a chantry in St. Paul's cathedral, made this rectory a part of its endowment (fn. 63) . In 1474, the prebend of Pancras was appropriated also to the same chantry: after the chantry was suppressed, the rectory of Chigwell continued to be, as it still is, annexed to the prebend of Pancras (fn. 64) , under which the great tithes are held upon a lease for three lives. In Bishop Grindall's time (the latter end of the sixteenth century) the rectory was on lease to Nicholas Fulham (fn. 65) . In the year 1650, it was reported by the commissioners appointed to inquire into the state of ecclesiastical benefices, that there belonged to the parsonage of Chigwell (which was a sinecure) 28 acres of glebe, besides a grove of about 20 acres, which, with the great tithes, they valued all together at 70l. per annum, out of which a reserved rent of 15l. was payable to the prebendary of Pancras; the parsonage was then on lease to Thomas Andrews, Esq. (fn. 66) In the beginning of the present century, the lease was vested in Sir Joseph Eyles; it was afterwards purchased by James Crokatt, Esq. who, by his will dated 1776, bequeathed his interest therein to his daughter Jane, wife of Sir Alexander Craufurd, Bart. (since deceased). A new lease was granted, in 1791, to Sir Alexander Craufurd for the lives of his three children, James, John, and Cecilia (fn. 67) . The present prebendary of Pancras, and, as such, rector of Chigwell, is the Rev. William Paley, Archdeacon of Carlisle. It appears that in ancient time a rector of this parish, having a plurality of benefices, instituted a vicarage here, and gave it to his kinsman, allowing him half the profits of the rectory. This practice of appointing vicars continued after his death; and in 1374, Henry Marmion being then rector, a vicarage was endowed with a house and glebe, the usual vicarial tithes, and the tithes of certain watermills (fn. 68) . In 1440, the vicarage was valued at 18 marks per annum. In the King's books it was rated at 18l. Since its connexion with the prebend of Pancras it has been in the gift of the prebendary (fn. 69) . Guild of the Holy Trinity. There was a guild, brotherhood or fraternity in the church of Chigwell, founded by Thomas Ilderton, and dedicated to the Holy Trinity; the lands belonging to which (being then valued at 2l. 3s. 4d. per annum) were granted to John Whitehorn and John Bailey, to be held of the manor of Sidmouth in Devonshire (fn. 70) . Samuel Harsnet, who was instituted to this vicarage in 1597, was a native of Colchester, and in the early part of his life was master of the grammar-school at that place. He afterwards became successively Bishop of Chichester and Norwich, and Archbishop of York. Before he was made a bishop, (being then chaplain to Bishop Bancroft,) he published an account of the impostures of one John Darrell, who had pretended to cure several persons possessed with devils. He was author also of a few other tracts (fn. 71) . The Archbishop, after he had resigned the vicarage, continued to reside at Chigwell, where he had purchased a house and estate, now the property and residence of his descendant Mrs. Fisher. Emanuel Utey, D. D. was ejected from this vicarage in the year 1641, in consequence of a petition from the inhabitants of Chigwell to the parliament, charging him with having erected an altar in the church, and having used offensive bowing and cringing; with having kissed the altar twice in one day; having read the prayers with his face to the altar, and his back to the people; and various other allegations of the like nature. A printed copy of the petition is in the British Museum. The commissioners, in 1650, found that there had been no settled minister at Chigwell since Dr. Utey's removal (fn. 72) . The present vicar is the Rev. Walter Kerrich, M. A. canon residentiary of Salisbury, collated in 1764, on the death of Fifield Allen, D.D. The earliest date of the register (fn. 73) of births, &c. is 1555. Average of Baptisms. Average of Burials. 1580–9 19 7/10 9 7/10 1630–9 184/5 11½ 1680–9 252/5 272/5 1730–9 30 7/10 34 7/10 1780–4 31 36 1784–9 323/5 274/5 1790–4 382/5 351/5 The present number of houses is about 210 (fn. 74) . In 1603, there were 28 burials; in 1625, 25; in 1665, 27. Six persons died of the plague in 1666. "Anne, daughter of Sr John Leeke (fn. 75) , baptized Aug. 27, 1609; Dorothy, Nov. 3, 1610; John, buried March 8, 1611–12; Elizabeth, buried Apl 1, 1619; Sr John Lake, buried Sep. 24, 1646; the Lady Lake, Oct. 7, 1652." "Elizabeth, daughter of Sr Peter Killigrew, Knt. baptized Aug. 3, 1626." "Lake, son of Sir Joseph Jordan, baptized June 20, 1666; John, his son, buried June 21, 1666." "The widow Gouldring, 100 years old and upwards, buried Nov. 12, 1671." "Robert, son of Sr George Jeffery (fn. 76) of the parish of Aldermanbury, buried Dec. 30, 1677." "The Lady Periant of King's-place (fn. 77) , buried Jany 5, 1678–9." "The Lady Anne Hobart, widow, buried Feb. 18, 1683–4; Lady Anne Hubbard, Aug. 14, 1706." "Susan, daughter of Sr Cæsar Child, Bart., and Lady Esther, (born in the parish of Barking,) baptized Apl 15, 1705; Anne, Feb. 23, 1706–7." "Anna, daughter of Sr Hugh Middelton, Bart. baptized Feb. 21, 1717–8; Hugh, July 31, 1719; another Hugh, baptized Oct. 21, 1722, buried Apl 8, 1723; a third Hugh, baptized Dec. 1, 1723; Sr Hugh Middelton, Bart. buried Nov. 16, 1756; Lady Anne Middelton, Dec. 31, 1764." "Richard, son of Richard Lestock, Esq. (fn. 78) , baptized July 14, 1723." There are several entries relating to the Harvey family. The present Eliab Harvey, Esq. married Lady Louisa, daughter of Earl Nugent, by whom he has one son and four daughters. Archbishop Harsnet, in the year 1629, founded two free-schools in this parish; the one for teaching children to read, write, and cast accounts, and the accidence; the other for teaching the Greek and Latin tongues. The Archbishop had previously built two schoolhouses at his own expence, and a house for the Latin master; he purchased also a house for the other master, and a garden for each house. The Archbishop, by an indenture, bearing date April 13, 1629, vested the above premises in certain feoffes (fn. 79) , together with the impropriated rectory of Tottington in Norfolk, which he assigned as an endowment (fn. 80) for his schools. The advowson of the vicarage was vested also in the said feoffees, who were to present to it a fit person, who had been either educated at the Latin school at Chigwell, or was a native of that place; if such could be found. The vicar of Chigwell, and the rector of Loughton, are always to be among the number of the feoffees, and to be governors of the schools, together with ten other persons, being the most able and substantial parishioners of Chigwell (fn. 81) . The governors elect the schoolmasters; the election must take place within ten days after the vacancy, otherwise the nomination lapses to the Bishop of London. The Latin schoolmaster must be a graduate in one of the universities; a man skilful in the Greek and Latin "tongues; a good "poet; of a sound religion; neither Papist nor Puritan; of a grave behaviour; of a sober and honest conversation; no tipler, nor haunter of alehouses; no puffer of tobacco; and, above all, apt to teach, and severe in his government." He is directed to teach Lilly's Latin, and Cleonard's Greek grammar;—for phrase and style, to infuse into his scholars no other than Tully and Terence;—for poets, to read the ancient Greek and Latin; no novelties, nor conceited modern writers." The qualifications requisite for the other master are, "that he write fair secretary and Roman hands; that he be skilful in cyphering and casting of accounts; and that he teach his scholars the same faculty." The present grammar-master is James Stewart Freeman, B. D.; the English and writing-master, Mr. John Vickery. The founder's ordinances contain many regulations for the government of his schools, and the behaviour of the scholars; prosessing himself much more solicitous that they should be instructed in the principles of the Christian religion (fn. 82) , and nurtured and disciplined in good manners, than instructed in good arts. The founder directs, that twelve, boys, natives of Chigwell, two of Loughton, two of Woodford, and two of Lambourn, shall be instructed gratis in the Latin school; in the other school, all the children of Chigwell, with the same number from Woodford, Loughton, and Lambourn, as in the other school. When it was found necessary to reduce the salary of the masters, the children in the Latin school were limited to half the number ordered by the founder; and those in the other school to twelve children of Chigwell, one of Woodford, one of Loughton, and one of Lambourn. This was done with the sanction of the Bishop of London, whom the founder appointed visitor; and to whom he directs the governors to present yearly an angel of gold as a new-year's gift (fn. 83) . William Penn educated at Chigwell. Girls' school. William Penn, founder of Pennsylvania, was educated at Chigwell; most probably at Archbishop Harsnet's school. There is a charity-school in this parish for twelve girls, established about the beginning of the present century, and supported by the collections at an annual sermon, and the interest of 100l. left to it, in 1725, by William Scott. Esq. There are alms-houses at Chigwell for three poor widows, who receive 1l. 5s. 8d. per annum each, paid quarterly, out of lands called Cardhams; formerly belonging to the Peningtons. It is not known by whom this endowment was left. Robert Rampston, anno 1585, gave 1l. per annum to the poor of this parish. Archbishop Harsnet charged the parsonage of Tottington with 10l. per annum, to be distributed weekly in bread to twenty-four poor persons of this parish. Ancient benefaction for the repair of a footpath. Mrs. Joan Sympson of Chigwell, in the year 1357, left certain lands, (now let at 14l. 14s. per annum,) for the purpose of keeping in repair the foot-path from Abridge in the parish of Lambourn, to Wynbridge in Woodford, being five miles in length, and leading through the village and parish of Chigwell from east to west. There is a spring near the windmill at Chigwell-row, of a cathartic quality; the water of which was recommended by the celebrated physician Dr. Frewen, who was a native of this parish (fn. 84) . It is now quite neglected. Footnotes 1 See Salmon's History of Essex, p. 34. 2 In the parish register. 3 At least 1500 acres; perhaps more. 4 The estate of Ralph de Limesei is thus described in the record of Doomsday: Ralph holds Cinghewell, in the hundred of Ongar, in demesne, which Earl Harold held of King Edward, as a manor of seven hides. There were always nineteen villans, two bordars, and two ploughs on the demesne lands. In King Edward's time the tenants had sixteen ploughs; now eleven. There is pannage for 700 hogs, and 31 acres of meadow. There has always been a mill on the estate. It was valued, in the Confessor's time, at 8l. 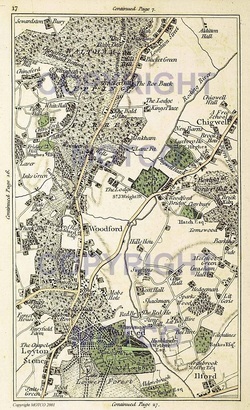 ; now at 10l.—Some other estates in the parish of Chigwell are thus described:—Six freemen held formerly in their own hands two hides and fifteen acres, which Robert Gernon enjoys now, by the King's grant, as he says; there were formerly three ploughs on this estate, now two; there is pannage for 40 hogs, and eight acres of meadow; in King Edward's time there was a mill, there is now none; this estate was always valued at 40s. A certain freeman held 30 acres, which Peter the sheriff now has. There was formerly a plough employed on it, but there is now only half employment for a plough; there is pannage for 30 hogs, and two acres of meadow; it is valued at 5s. Peter had livery of this land with his fee; and he found six beasts, 17 sheep, and 11 hogs; there are now 10 beasts, 60 sheep, and 20 hogs. Ralph de Limesei holds six acres within the King's jurisdiction; but his predecessor took possession of them illegally. 5 Morant, vol. i. p. 165. 6 These grants are all printed at full length in Madox's Formulare Anglicanum. 7 Robert de Fitzwalter died seised of the see, anno 1328. Esch. 2 Edw. III. N° 59. Walter Fitzwalter, anno 1387. Esch. 10 Ric. II. N° 15. 8 Cart. Antiq. in the Augmentationoffice. 9 They presented to the rectory, (which always went with this manor,) in 1392 and 1400. See Newcourt's Repertorium, vol. ii. p. 142. 10 Esch. 16 Ed. IV. N° 76. 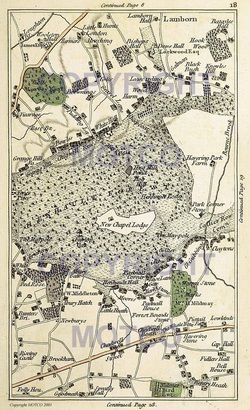 11 Madox's Formulare.—The premises then conveyed (for the sum of 1000 marks) consisted of the manors of Chigwell Hall and West-hatch, with their appurtenances, viz. six messuages, 300 acres of arable land, 300 of meadow, 300 of pasture, 80 of wood; and 12l. rents, in Chigwell, Theydon, Lambourn, and Barking. 12 Record in the Augmentation-office. 13 Pat. 4 Edw. VI. pt. 9. July 4. 14 Cl. 21 Car. II. pt. 15. N° 15. 15 Cart. Antiq. Augmentation-office. 16 Esch. 15 Edw. IV. N° 32. 17 See note 11. 18 Morant, p. 166. 19 It is thus described in that record, (being placed in Chelmsford hundred. )—Anschetill holds Cingewell of Robert (Gernon) which Doth formerly held as a manor of two hides. There was always one villan, two bordars, and two ploughs on the demesnes; the tenants have always employed one plough: there is pannage for 30 hogs, and 20 acres of meadow: there was always one sumpter-horse, six beasts, twelve sheep, and fourteen hogs. It was valued, in King Edward's time, at 40s. ; now at 4l. 20 Cole's Escheats, Harl. MSS. N° 758. 21 The whole account of this manor is taken from Morant, (vol. i. p. 166, 167.) except the obit referred to in the last note. 22 Morant. 23 It is thus described in the record: —Harold holds Ulfemestun for a manor, and three hides, and 40 acres. It is now the King's. There were always four vils; formerly two bordars, now six; the tenants have always employed one plough. There is pannage for 60 hogs, and four acres of meadow. In King Edward's time it was valued at 20s. ; now 40s. A certain freeman held 20 acres, in King Edward's time, which are now uncultivated. They were always a part of the demesne, and are now in the hands of the sheriff as a farm of the King's. 24 Morant's Essex, vol. i. p. 167. 25 Testa de Nevil. 26 Morant. 26 Pat. 13 Edw. I. m. 15. Robert Earl of Oxford died seised of this manor, anno 1296, surviving his son-in-law, to whose heirs the reversion then devolved. Esch. 24 Edw. I. N° 62. 27 The Earl of Arundel had the Royal licence (anno 1324) to impark 50 acres of the forest, in his manor of Woolston. Pat. 17 Edw. II. pt. 2. m. 7. 28 Esch. 4 Hen. V. N° 54. 29 Esch. 29 Hen. VI. N° 27. 30 Esch. 1 Edw. IV. N° 46. 31 Morant, p. 168. William Scott, Esq. the grantee, died seised of it in 1491. 32 From the information of Mr. Bodle. 33 Pat. 29 Hen. VIII. pt. 5. Mar. 26. 34 Cl. 1 Mar. pt. 8. 35 Morant and Jones's Index, referring to Pasch. record, 11 Eliz. Rot. 52. 36 See Morant, p. 169. 37 Ibid. 38 See Morant, p. 169. 39 Alex. Goldyngham relax. Dom. Regi tot. jus in ter. & ten. in Chigwell q. Rex acquisivit de M. de Torkesey. Cl. 46 Edw. III. m. 7. 41 Rob. Langford & al. Dom. Regi Mess. & 28 ac. terr. in Chigwell. Cl. 16 Edw. IV. m. 9. 42 See the record referred to in note 44. 43 Ibid. 44 Pat. 4 Hen. VIII. pt. 2. Feb. 28. 45 Pat. 39 Eliz. pt. 11. Jan. 31, in the names of Spencer and Atkinson. 46 The descent, from this period, is taken from title-deeds obligingly communicated by the present proprietor. 47 Lady Perient appears to have resided at King's-place till her death, in 1679. See the parish register. 48 The will is registered in the Prerogative-office under the year 1716. 48 The abbot and convent of Stratford had a grant of free warren in their lands at Chigwell, anno 1253. Cart. 37 Hen. III. N° 13. 49 Record in the Augmentation-office. 50 Holman's Essex notes; in the library of Thomas Astle, Esq. F. R. S. S. 51 See a farther account of it in the Appendix. 52 See p. 113. 53 Arms—1. Checky O. and S. a chief G. guttèe des larmes—Coleshill. 2. S. a cross flory O.—Upton. 3. Checky G. and O. on a bend of the second three horse-shoes Az. 4. Six lozenges, 3, 2, 1. 5. G. a bend of mascles O. 6. Arg. a tower between eight fl. de lis S.— Sumester. 7. Arg. a chevron between three bears' heads erased with muzzles S.—Penarth. 8. Az. three waterbougets O. in chief three bezants—West. 9. Arg. a hand and arm issuing from a cloud on the sinister side fesseways and grasping a dexter hand erected and couped at the wrist, all proper—Oliver. 10. O. a chevron between three bats displayed G.—Battesford. 11. O. a saltier between four eagles displayed Az.—impaling, 1 and 4. O. on a chevron V. three eagles' heads erased of the field—Crayford; 2 and 3. G. five martlets O. on a chief indented of the second, three crowns Az. 54 Archbishop Harsnet directed, by his will, that a stone should be put over his grave, with the above inscription, and the effigies of a bishop fastened into the stone an inch thick, and so riveted down that sacrilegious hands should not rend off the one without breaking the other. He left 10l. to be spent at his funeral in a sober, civil banquet, by as many of his parishioners as should choose to attend. 55 See more of him, p. 124. 56 Arms—Per pale indented A. and S. a faltier counterchanged—Scott of Stapleford Tany, impaling, Checky O. and Az. a fesse G. fretty Erm.—Cheyne. On another escutcheon—1 and 4. Scott; 2. G. three boars' heads erased between nine cross crosslets O.—Swinbourn; 3. Per pale S. and Erm. a fesse counterchanged—Fitz-Richard—impaling, S. three pickaxes Arg.—Pigot. George Scott, Esq. who died in 1588, married Margaret Pigot. It is probable that she was his second wife. Morant, in his account of the family, does not mention this match. He was great uncle to George Scott, who died in 1683.—There is another impalement—G. three demi-lions ramp. O. The said George Scott married also Dorothy, daughter of John Franck, Esq. of Hatfield Broadoak. See Morant. 56 Arms—Scott, as before, impaling Arg. two bars S. in chief three buckles Az.—Luther. 57 The family of the Peningtons, who had been settled at Chigwell for many generations, became extinct by his death. The house in which they resided, with the lands belonging to it, descended to John Branston, Esq. ; who married Mary, one of this Mr. Penington's daughters. On the death of Mary, daughter of Mr. Branston, and wife of the Hon. Edward Byng, most of the lands were sold to Sackville Bale, Esq. : the house was purchased by Edward Tymewell, Esq. ; after his death, was sold to John Raymond Esq. and is now the property of James Urmston, Esq. a captain in the service of the East India Company. See Morant, vol. i. p. 170. 58 Arms—S. two chevronels Arg. between three lozenges of the second, each charged with a Cornish chough. 59 Arms—Arg. on a sesse V. three cinquefoils of the field. 60 Pat. 24 Edw. III. pt. 1. m. 24. 61 Cl. 5 Hen. IV. pt. 1. m. 13. 62 Pat. 18 Hen. VI. pt. 3. m. 2. 63 Newcourt's Repertorium, vol. ii. 64 Ibid. 65 Regist. Grindall. 66 Parliamentary Surveys, Lamb. MS. Library. 67 From the information of R. Shawe, Esq. 68 Newcourt's Repertorium, vol. ii. 69 See the preceding page. 70 Holman's Essex Collections in the library of Thomas Astle, Esq. F. R. A. S. 71 Ant. Wood's Athen. Oxon. vol. i. 72 Parliamentary Surveys. 73 The old register-books have been handsomely bound in Russian leather, by the churchwarden Mr. Sotheby, bookseller in York-street, Covent-Garden, who has a house at Chigwell. 74 The village itself is but small; there are about 60 houses at a hamlet called Chigwell-row, a mile S. E. from the church; there are several houses also at Grangehill, and Buckhurst-hill; and scattered about Horn-lane, Gravel-lane, and Vicarage-lane. 75 Son, it is probable, of Jasper Leeke, Esq. ; who married one of the coheirs of Thomas Coleshill, Esq. See p. 119, 120. 76 Most probably, Sir George Jefferies, Recorder of London, afterward Lord Chancellor. 77 See p. 118. 78 I suppose this to have been the celebrated naval officer who was promoted to the rank of admiral in 1743: his name is well known on account of the memorable dispute between him and Admiral Matthews, relating to the conduct: of each, in an engagement with the fleets of France and Spain off Toulon, in 1744. It terminated in the acquittal of Lestock, (who had been suspended by Matthews, his superior in command,) and in the dismissal of the latter from the service. 79 Twenty-one in number; the trust to be renewed whenever they should be reduced to five. 80 It was then worth 60l. per annum, clear of all deductions; the founder, in his ordinances, expresses his confidence that it would always produce that rent. It sell so low in value, nevertheless, that, in 1691, it was let only at 30l. per annum. In 1712, it was raised to 40l. ; it is now let at 210l. During the abatement of the rent, it became necessary to reduce, considerably, the salaries of the masters, which the founder had fixed at 20l. per annum for the Latin master, and 25l. per annum for the other; the overplus, after deducting 10l. per annum given to the poor in bread, was appropriated for repairs and incidental expences. 81 The present governors are, Walter Kerrich, M. A. vicar; Thomas Layton, M. A. curate; James Salt Lovatt, M. A. rector of Loughton; Eliab Harvey, Esq. ; James Urmston, Esq. ; Joshua Jenour, Esq. ; Peter Anthony Sapte, Esq. ; George Curling, Esq. ; Mr. John Sotheby; Mr. William Hopkins; Mr. Timbrell; and Mr. James Druce. 82 The Archbishop built a gallery in the church for the use of his scholars; who are enjoined to attend divine service every Sunday and holiday. 83 The above abstract is taken from documents relating to the schools, printed for the use of the governors; and obligingly communicated by Mr. Layton, to whom I am indebted for other assistance during my inquiries in this parish. 84 See Morant's History of Essex, vol. i. p. 164. Chigwell is a parish and village 5 m. N. of Ilford. The Church, Woolston Hall, Rolls and the Grammar School are the principal monuments. The King's Head Inn (8) has been identified with Dickens' Maypole Inn. Ecclesiasticalc(2). Parish Church of St. Mary the Virgin stands in the middle of the parish. The walls are of flint-rubble covered with cement and with dressings of limestone; the roofs are tiled. The Nave and Chancel, now the South Aisle, were built in the 12th century. Late in the 15th century the N. arcade and a N. aisle were built, the bell-turret added, and the chancel perhaps extended. In the 19th century the existing Chancel and Nave were built on the site of the former N. aisle and the former chancel and chancel-arch re-built. The S. doorway is interesting 12th-century work, and among the fittings the Harsnett brass and the Tudor cup are noteworthy. Architectural Description—The South Chapel (former Chancel) is modern except for an arch in the N. wall which forms the easternmost bay of the N. arcade. The South Aisle (49 ft. by 23 ft.) former nave, has a late 15th-century N. arcade of four bays of which one overlaps the former chancel; the two-centred arches are moulded and the moulded piers have each four attached shafts with moulded capitals and bases; the responds have attached half-piers. In the S. wall are three windows; the easternmost is of c. 1400 and of two cinque-foiled lights with vertical tracery in a two-centred head, mostly plastered; the second window is entirely modern; the third window is probably of the 12th century, but has an inserted mullion and is modern externally; the E. splay has been cut back to widen the glass space; further W. is the mid 12th-century S. doorway with semi-circular arch of four orders, of which one has cheveron ornament and the innermost forms a panelled tympanum with indented ornament with a segmental soffit; the jambs have each a free shaft with cushion capital and re-cut base. In the W. wall is a window of three pointed lights in a segmental-pointed head, probably of the 15th century but covered with plaster. The bell-turret at the W. end of the S. aisle stands on eight posts with tie-beams, curved braces and curved struts of the 15th century, partly restored. The Roof of the S. aisle is of 15th-century date and of three bays with hollow-chamfered tie-beams, rebated king-posts, four-way struts and a central purlin. Fittings--Brasses: In chancel—in recess on S. side, (1) of Samuel Harsnett, Archbishop of York, 1631, bearded figure in mitre, cope, rochett, etc., with book and crosier, foot and marginal inscriptions and four shields of arms, evangelists with their symbols and cherub-heads. In nave— on S. wall, (2) inscription recording benefactions of Robert Rampston, 1585. Monuments and Floor-slabs. Monuments: In S. chapel—on S. wall, (1) of Thomas Colshill, 1595, and Mary (Crayford) his wife, 1599, wall-monument with kneeling figures of man, wife and two daughters at prayer-desk, with side pilasters, entablature, urns and a shield of arms. In nave—on S. wall, (2) to George Scott, 1683, and Elizabeth (Cheyne) his wife, 1705, black and white marble tablet with Corinthian columns, broken pediment and three shields of arms, two in detached panels. In church-yard—(3) to William Browne, 1653, Sarah, his wife, 1643, and their son, (1711? ), table-tomb of red brick with plain stone pilasters and top slab. Floor-slabs: In S. aisle—(1) to Sarah (Abdy) wife of John Penington, 1690, also John Penington, 1702, with shield of arms; (2) to Ann Pelling, 1712, with shield of arms. Plate (Plate p. xxxix): includes a secular cup of 1605 or 10 engraved with Tudor roses alternating with sunflowers; cover-paten of 1559; cup and paten of 1633; paten of 1633 and a flagon of 1713 with a shield of arms. Stoup: In S. aisle—E. of S. doorway, with chamfered jambs and round head, date uncertain. Secularb(3). Homestead Moat, about 1 m. W.N.W. of the parish church. a(4). Rolls, house about ¾ m. N.N.W. of the parish church, is of two storeys with attics; the walls are partly timber-framed and partly of brick, and the roofs are tiled. The kitchen block, in the middle of the house, was built c. 1600, and late in the 17th century the N.E. and N.W. wings were built or re-built, making the plan L-shaped. Early in the 18th century a long addition was made on the S.E. side of the N.E. wing and there are modern additions on the S. and S.W. The elevations have been very largely re-faced, but on the N.W. side there are two late 17th-century chimneystacks with pilasters at the angles. Inside the building the kitchen has some original shelves with elaborately shaped and moulded framing carried down to the floor as arms to a former bench. The staircase in the kitchen wing has original square, moulded balusters, square newels with moulded tops and bases carved with roses, moulded strings and rails. The attic staircase has original flat shaped balusters. There is also a little panelling, some 17th-century doors and exposed ceiling-beams. a(5). Woolston Hall, about 1¼ m. N.W. of the parish church, is of two storeys with attics; the walls are partly of plastered timber-framing and partly of brick; the roofs are tiled. It was built c. 1600 on an L-shaped plan, with the wings extending towards the N.W. and N.E. ; there are modern additions on the N. The chimney-stacks have grouped rectangular shafts, one being of cross-shaped plan set diagonally. The front has an early 18th-century eaves-cornice. Inside the building are some exposed ceiling beams, and the fireplace in the entrance hall has a 17th-century moulded shelf with a panel above it, painted with an achievement of the Scott arms and trophies. The garden in front of the house has fine early 18th-century wrought-iron gates with an elaborate overthrow. c(6). The Grammar School, 60 yards N.E. of the parish church, is of two storeys; the walls are of brick and the roofs are tiled. It was built probably when the school was founded in 1629. The master's house at the E. end and the porch are modern. In the N. wall are several original windows, now blocked, and of two pointed lights in a square head with a moulded label. On the S. side most of the windows are modern, but two stone windows on the first floor are original and have square heads and four lights. Inside the building the Hall rises to the full height and has two original tie-beams with curved braces and moulded and shaped queen-posts. There are also some original doors. c(7). Church House, S.W. of (6), is of two storeys timber-framed and plastered; the roofs are tiled. It was built early in the 17th century but has been much altered. The original chimney-stack is cross-shaped on plan. Inside the building are some original ceiling-beams. c(8). King's Head Inn, opposite the church, is of three storeys with attics and cellars; the roofs are tiled. It was built early in the 17th century and has a late 17th-century wing at the back; there are many modern additions. On the W. front (Plate p. 49) the first and second floors project and have original carved brackets and modern bressumers. Set in the wall of the second storey are carved brackets indicating the former bases of the gables. The original central chimney-stack has grouped diagonal shafts. On the S. side of the late 17th-century wing are fragments of a Doric frieze and cornice of wood. Inside the building one room on the first floor has panelling partly of mid 17th-century date and a cornice returned along the cased and panelled ceiling-beam; the fireplace (Plate p. 247) has a carved, eared architrave flanked by diminishing pilasters supporting a moulded shelf and an overmantel divided into three bays by Ionic columns; the side bays have pedimented panels with strapwork and the freize has carved swags. The upper staircase has original and symmetrically turned balusters and square newels with moulded caps. The following monuments, unless otherwise described, are of the 17th century and of two storeys, timber-framed and plastered; the roofs are tiled. Several of the buildings have original chimney-stacks and exposed ceiling-beams. c(9). Harsnett House, N.E. of (8), has modern additions at the S. end. Inside the building the staircase has a few original turned balusters of symmetrical form. c(10) The Grange, house in Chigwell Road, ¼ m. N.N.E. of the parish church, was originally built in the 15th century, but has been entirely re-built and altered except for part of the roof. This has an original king-post with moulded capital and base, four-way struts and a central purlin. There is also a little 17th-century panelling. a(11). Pettits Hall, about 1 m. N.E. of the parish church, was built in the 16th century, but the N.E. end has been re-built and there are various modern additions. On the S.E. front the upper storey projects at the S. end and is gabled. The central chimney-stack has grouped diagonal shafts partly of the 17th century. Two windows have original moulded mullions. a(12). Turnours Hall, about 1¾ m. N.E. of the parish church, has been much altered and enlarged. Inside the building the entrance hall has a moulded cornice and an original doorway with a four-centred head and moulded architrave; the fireplace (Plate p. 247) is flanked by Ionic pilasters supporting carved terminal figures with an enriched entablature; between the figures are two panels with enriched bolection mouldings; the work is of early 17th-century date refixed with some later details. a(13). Marchings, house ¼ m. S.E. of (12), was built probably early in the 16th century, but has been almost entirely altered. Inside the building is an original window with diamond-shaped mullions, and now blocked. c(14). Brownings, house in Gravel Lane, about 1½ m. E.N.E. of the parish church, has a late 17th-century addition at the E. end and a modern addition at the back. The original chimney-stack has two diagonal shafts. c(15). The Retreat, house, at Chigwell Row, 600 yards N.E. of All Saints Church, was built probably in the 16th century, but has been almost entirely altered. On the S. front the upper storey projects at the W. end and is gabled. b(16). Brookhouse Farm, house 650 yards S.W. of the parish church, has on the S.E. front two gables with original moulded and carved bargeboards. The central chimney-stack has grouped diagonal shafts. Inside the building is some original panelling with fluted pilasters.